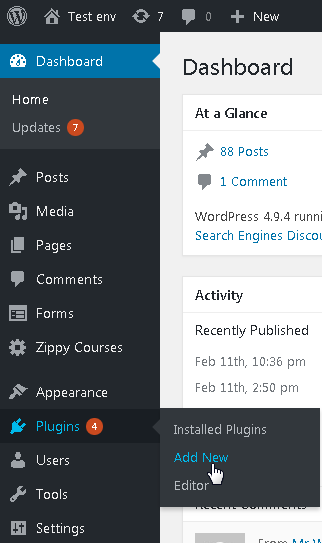 Go to the section Plugins and choose Add New. Type vooPlayer into the Search box. Click on Install Now and then just click Activate. 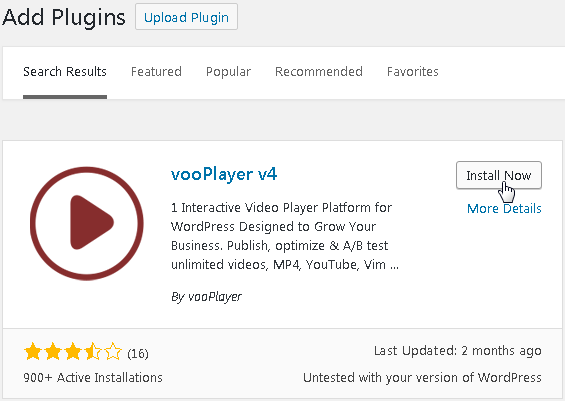 The vooPlayer plugin will appear on the sidebar of the Dashboard inside of your WordPress admin area. It is used just to connect your vooPlayer account with WP, so please proceed to login in with your vooPlayer username and password. How to use vooPlayer widget? Next step would be to use the newly added vooPlayer Shortcode widget that will be inserted into your Posts and Pages editor. From the widget you will be able to select any video or module and customize it's appearance, select do you want it to be embedded or appear as a popup, or a float player. Just go to add a new Post or Page, switch to the Visual style and the vooPlayer widget will be available right there in the editor. When you choose the desired video and settings, just click on the GENERATE SHORTCODE button and your short-code for that specific video will be inserted. Now, click on the Publish button and that's it!